Link Ball 1.5x2/M1.2: Remove original one using a smaller plier (the base of the ball have flange nut), heat with lighter or solder iron the ball in order to remove it easy. 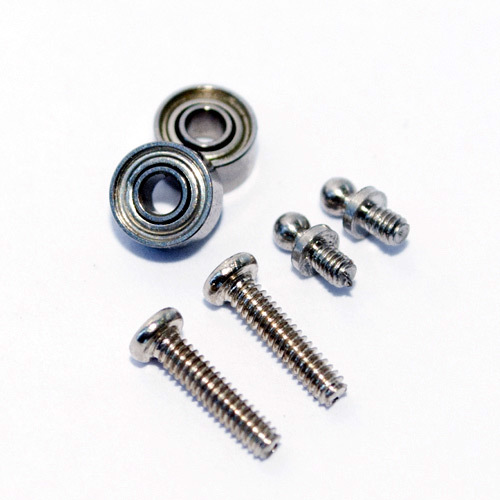 1.5x4x2 Radial Bearing: Original bearing are installed with lock thread compound to assure the best assembly precision, the fast and easy way to unlock the bearing form they position is put 5 minutes in boil water. Use smaller pliers to manipulate it and with a 1.5 hex screw drive you can easy push out the bearing. To push in place the bearing you can operate with 3mm hex screw driver. M1.4x6 Pan Head Screw Silver: These screws just replace the original one used to lock tail blade.